The first to come to mind (and to hand sitting at my laptop ) is a program called Circuit Wizard, I’ve already used this in previous posts to create my circuit diagrams. 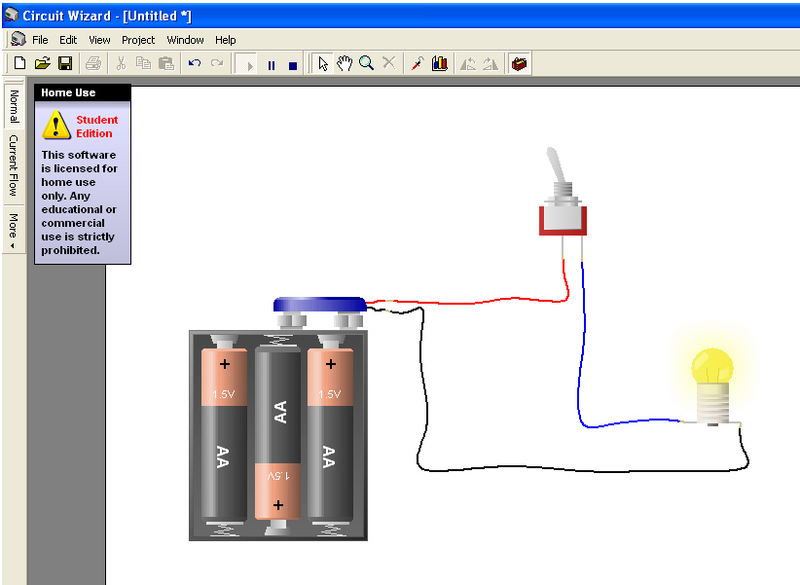 You can build a circuit using symbols or pictures of the components, (it’s really helpful to have a go at the pictures version with some simple circuits first if you have trouble reading circuit diagrams) this makes it easy to build up larger circuit diagrams quickly as you don’t have to spend time drawing out and labeling loads of components. 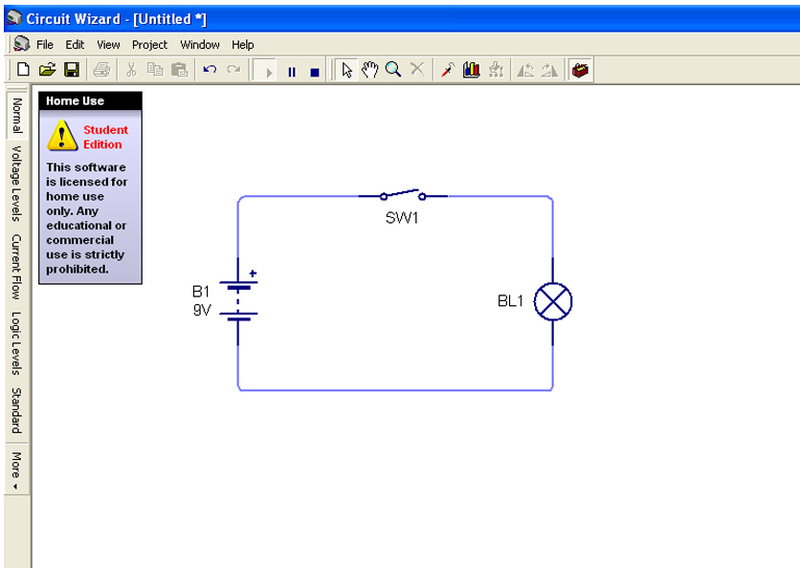 This programme also has an amazingly useful function where by you can simulate applying power to your circuit. It gives you real time results of what your circuit will do (or won’t if you’ve made a mistake ) You can check that a circuit you have designed will work and do what it is intended to do without ever having to pick up a soldering iron. 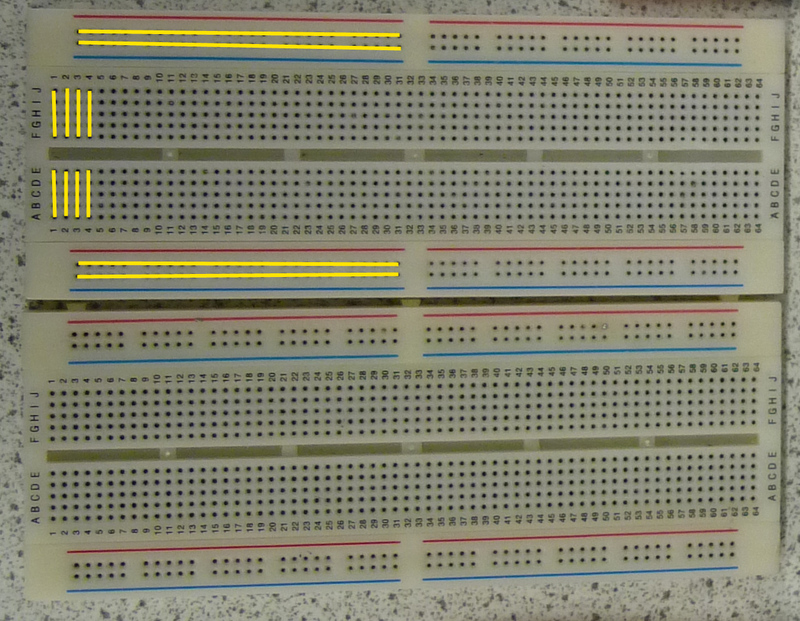 The yellow lines on the photo above show where the metal strips run: the top and bottom strips run horizontally and connect every socket in that row (they break where the red and blue lines stop), the vertical strips in the main body of the board connect up 5 sockets in a numbered row. The gap in the middle is designed for ICs to straddle, this gives you independent connections for each pin. When you poke a component lead or a wire into a socket it makes contact with the metal strip, by plugging in components and connections in the right way and running a power supply to your breadboard you can build a working circuit and because none of the components are permanently fixed it’s easy to tweak component values without the hassle of un-soldering and re-soldering. Once you’ve got your circuit working the way you want it to you can transfer it to a PCB. It’s also best to keep any circuit inputs on the left side of the board and any out puts on the right side, this keeps everything nice and neat and can be a big help when it comes to fault finding. Oh and only ever use single core wire on a breadboard, not only will multi core bend and wiggle when your trying to push it in the sockets but small bits can break off and cause shorts! Hopefully you now have a working circuit, if not you need to move into the realms of circuit analysis which I’ll go into later.